Both pneumatics and hydraulics are technologies useful in manufacturing heavy equipment and machinery. Each has qualities that are suitable for different projects. This is a liquid counterpart of pneumatics. Hydraulics use water or oil to transmit power. This type of technology is being used in different machines such as cranes and other construction materials like garbage trucks and even car brakes. For example, to have a better control of the crane arm, the engine pushes hydraulic fluid through thin pipes. Advantages. A liquid cannot be compressed, which makes a big advantage for hydraulics. We all know that doing a belly flop into a pool hurts so much. That is because water doesn’t squeeze downwards when you slam against it. This is why the property of liquids is ideal for creating strong machinery. Hydraulic systems can handle more pressure compared to a pneumatic system as liquids can’t be compressed. Water hydraulics are cost-effective because water is inexpensive and easy to transport. There is also no delay in the operation of a hydraulic machine. Disadvantages. The risks of using liquids as an energy source are leaks in valves, seals, and hoses. Fluid in hydraulics can also cause corrosion. Hydraulic machinery also can’t be used in food manufacturing as it can be contaminated by hydraulic fluid leaks. Unlike hydraulics, pneumatic systems use gas or air to transmit power. These systems are mainly used in general construction and mining. Moreover, they are also used in dental equipment like drills, dental chairs and other tools. Other common pneumatic tools devices are air compressors, jackhammers, air brakes, air rams, and vacuum pumps. Advantages. With pneumatics, your equipment is free from corrosion as there is no moisture that can corrode internal parts of the system. You won’t also worry about leaking as the system uses gas. Pneumatics come in simple designs that are made from cheaper materials. Disadvantages. 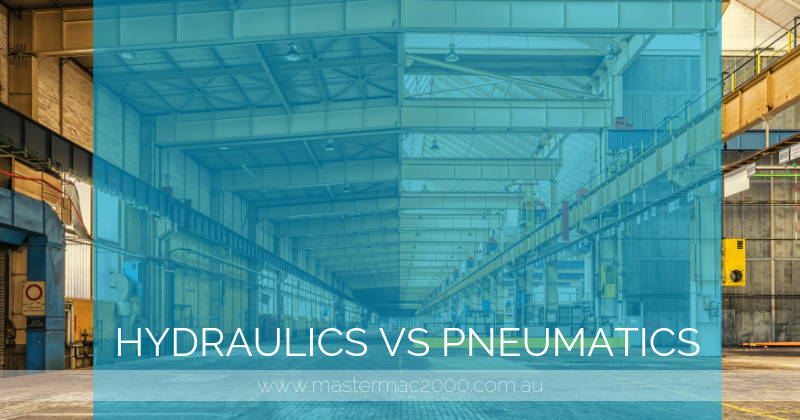 The major disadvantage of pneumatics is that they can’t reach as high of a pressure compared to hydraulics. While air is easily compressed, there will be delays in the movement of the pneumatic devices. They can’t be used for a larger project as they are more effective on low-scale construction or mechanical jobs. It is essential to know the advantages and disadvantages of using hydraulics and pneumatics. They both serve the same benefits as they easily finish any work. If you need pneumatic tools like air rams, Mastermac2000 can provide you quality air tools. Contact us now!